Of 80 fluorescent pseudomonad strains screened for phosphate solubilization, three strains (BFPB9, FP12 and FP13) showed the ability to solubilize tri-calcium phosphate (Ca3(PO4)2). During mineral phosphate solubilization, decrease of pH in the culture medium due to the production of organic acids by the strains was observed. These phosphate solubilizing strains produced indole-3-acetic acid (IAA) and protease as well as exhibited a broad-spectrum antifungal activity against phytopathogenic fungi. When tested in PCR using the gene-specific primers, strain BFPB9 showed the presence of hcnBC genes that encode hydrogen cyanide. 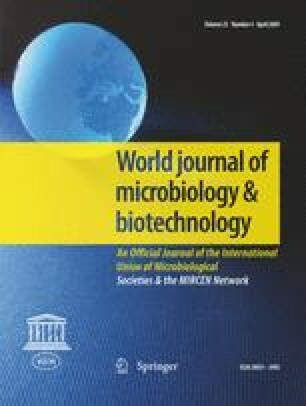 On the basis of phenotypic traits, 16S rRNA sequence homology and subsequent phylogenetic analysis, strains BFPB9, FP12 and FP13 were designated as Pseudomonas aeruginosa, P. plecoglossicida and P. mosselii, respectively. Present investigation reports the phosphate solubilization potential and biocontrol ability of new strains that belong to P. plecoglossicida and P. mosselii. Because of the innate potential of phosphate solubilization, production of siderophore, IAA, protease, cellulase and HCN strains reported in this study can be used as biofertilizers as well as biocontrol agents. We thank the Department of Biotechnology, Ministry of Science and Technology, Government of India for financial assistance.